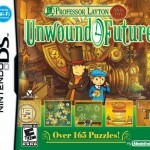 Archaeology professor Hershel Layton and his young apprentice, Luke, receive a mysterious letter. The contents mention a complicated threat to London, but a future London, and the letter is written by Luke 10 years from now! Being true gentlemen, how could the pair turn down a request for help? Following the future Luke’s directions, Layton and Luke are transported to a city overrun with corruption that is like nothing they could have ever imagined – and the criminal overlord is Layton himself! The Layton trilogy (as it is so far, at least until the crossover with Phoenix Wright comes out this year) seems to be relatively obscure in the west. A couple of commercials for the DS a few years ago featured the first game, Professor Layton and the Curious Village, but didn’t really seem to say much about it and just showed a couple clips of puzzles. I was underwhelmed, to say the least. However, at the recommendation of Agent Tricky, I gave the first one a shot, and three games later, I’m still hungry for more. The gameplay is the same here as in the prequels. The touch controls are simple to navigate and allow you to travel between crisp, stylized city settings where you talk to the locals and discover puzzles to solve that develop the plot’s many mysteries and lead to even more puzzles. The puzzles themselves range wildly from incredibly easy to impossibly obscure, with most falling somewhere in the middle. Beyond that, there are a few additional minigames that become available over the course of the story for which you unlock content piece by piece by solving puzzles out in the main game. All of the puzzles exercise a wide range of thinking styles – spatial, visual, logical, mathematical, and abstract. This broad approach means there’s something in it for fans of all kinds of challenges and ensures there’s always another puzzle to look forward to that each will enjoy. 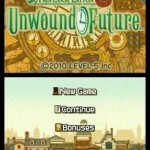 In between those puzzles, Unwound Future weaves a complex tale to keep the gamer interested, on par with the best detective stories I’ve ever encountered, with several characters and two time periods to try to keep straight, all linking back to a key time in Layton’s past that deepens the character of the up-until-now too-selfless consummate gentleman professor. It stumbles once or twice, but keeps its stride pretty much the entire time. The game also throws a HUGE twist in near the end that turns everything on its head and raises the stakes to global proportions, and the best part is that, even though it seems to come out of nowhere, it all makes sense. A similar level of twist was used in Diabolical Box, but it’s made much more believable here. Another improvement is that the puzzles that seem more like the odd element out in this game, whereas in other puzzle games the story often suffers most and is used to tie the puzzle elements together with weak gossamer threads. Another thing that continues to impress in this game, as it has in other Layton games, is the production value. The art is slick and consistent; the music is repetitive but appropriate and never obtrusive. And, for anyone who has not played a Layton game before, the cutscene quality and voice acting rivals ANY television animation out to date – yes, even on a tiny DS screen. The few actually action-heavy scenes are done incredibly well, and it’s a treat to have them available to watch again upon the game’s completion. 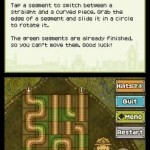 Some of the other content you unlock by finishing the game includes character art and soundboards, bonus puzzles based on how many piccarats (what you get for solving each puzzle) you acquired over the course of the game, as well as a special puzzle you can only unlock by having a code from beating a previous Layton game. You can also, if you have a proper Wi-Fi hotspot, download a Puzzle of the Week to keep the challenges coming. In my opinion, Layton games don’t have much replay value for the story, but even by the end of the game, I’ve forgotten what many of the earlier puzzles are, and some of them are difficult enough (as with a Sudoku puzzle) that doing one right after finishing it would still be challenging. Thankfully, the game also allows you to replay any puzzle you want, so having it around after you complete it offers you plenty to do, like keeping an erasable puzzle book on your shelf. 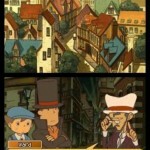 Of course, if you’re not a fan of puzzles or mysteries, Layton doesn’t really offer you too much. However, even if you’re a casual fan of such things, Layton is a wonderful game that offers tons of both and promises to not leave you disappointed.